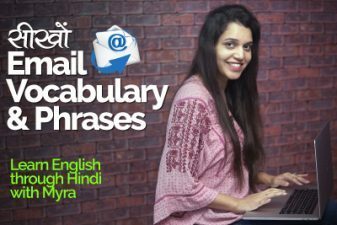 In this daily English speaking practice lesson for beginners, explained in Hindi by Kabir,you will learn English proverbs, proverbs are sayings and have hidden message. Proverbs are often by native English speakers in their daily spoken English conversation. Proverbs add more style to your English communication, so why not learn some proverbs and speak fluent English confidently. One who is repenting so much on killing a mosquito, herself cannot survive without non veg food, it’s true a devils martyr can never be a gods martyr. Ramu who was madly in love with Sima, now roams about badmouthing her, it seems that the grapes were sour. So what you’r saying is If the sky falls we will catch the lark, thus this house can never be made. He is between the devil and the sea, at home it’s mother in law and at office, the auditor. You aren’t stuck between the devil and the deep sea, that you can’t take out time for friends. Touch your nose, god bless, you are always looking for a thing when it is in the mouth. You are looking for a thing when it is in your mouth, Raju is a driver too. Keep an eye on Shyam, old habits die hard. Although he off it still I request you not to smoke in front of him, as old habits die hard. If you would’ve really done something for them, then you wouldn’t have had to blow your own trumpet today. In this thankless job, one has to blow his own trumpet. I had been telling you from the start to get up early in the morning and study, now no use crying over spilt milk. Yep, it’s a puncture, told you to get the air pressure checked, now no use crying over spilt milk. You can’t bad mouth smoking having never smoked yourself, a blind man is no judge of colors. और आपको ये lesson कैसा लगा, कृपा comments मे ज़रूर लिखियेगा। तो जल्द मिलते है फिर एक नये विषय के साथ, तब तक के लिये आप सब ख़ुश रहिये, no tensions no worries, और keep talking English keep practicing. Next Next post: किसी BAD NEWS का जवाब कैसें देंगे?